What is the Chiren® Instrument? 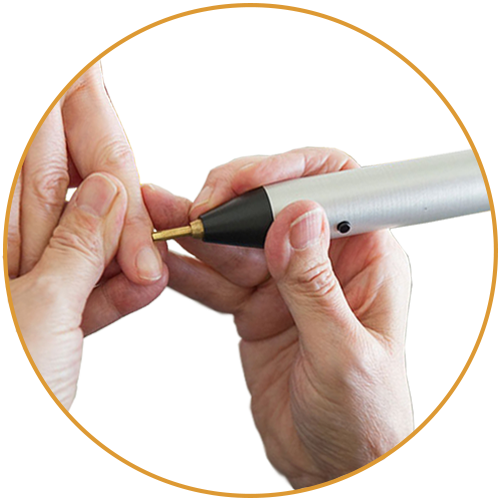 The Chiren® is a specially developed bio-resonance instrument designed in Germany which measures 120 acupuncture meridian points on the fingers and toes . These meridian points correspond to the various organs systems. Each point tested has a frequency which will be coherent i.e healthy, or incoherent i.e. disturbed. Healthy cells radiate coherent light and unhealthy cells radiate chaotic light. When a disturbance is found, the opposite frequency is applied to eliminate it. 1) One assessment system – to see where & what the disturbances are. 2) One part that corrects these disturbances. 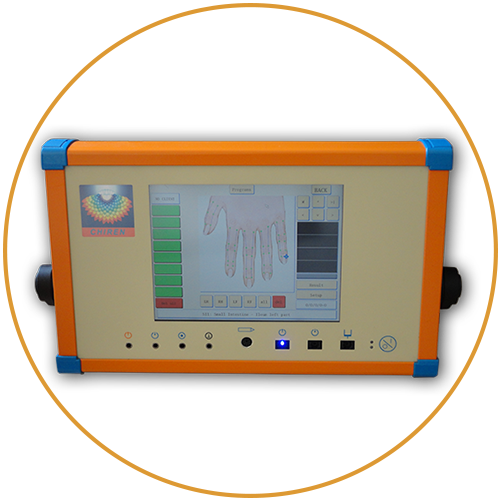 The assessment system is based on the EAV (Electro-Acupuncture- according to Voll). This instrument measures the galvanic resistance of the skin and what is being observed is : a straight line or a hyperbole. When it is a hyperbole, there is something wrong, with a straight line everything is in order. Additionally, all biophoton measurements are quantitive. This measurement is followed by a secondary measurement of the QUALITY of that specific point. If the previous measurement shows a hyperbole, then another measurement has to follow in order to determine what is incorrect. This is a QUANTITATIVE measurement. However, this indication corresponds fully to the biophoton measurements. When an individual measures biophoton emission, one gets either a straight line when there is maximum coherency, or a hyperbole when the light is chaotic. This measurement will determine on the basis of the quality of the chaotic signal that comes from the body, thereby identifying the disturbance. The treatment section of the CHIREN® is then able to send back the opposite signal into the body, thereby neutralizing the disturbing signal. The CHIREN® has an extensive library of numerous diseases and bacterial or viral infections to match the signal coming from the body. How does the Chiren® Instrument work? In 1974, biophotons were discovered by Fritz-Albert Popp, a theoretical biophysicist in Germany. He established the existence of biophotons beyond any reasonable doubt, and proved they originate in the DNA of the cell. 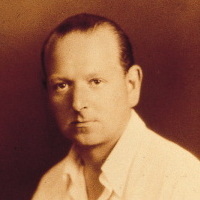 He discovered that this light called biophotons emanates from every living cell at a rate of 100,000 impulses per second. Biophoton Light Therapy tracks down and eliminates disturbances in the body. Everything has its own specific light emission and vibration. Every biochemical reaction in the body is a result of an electromagnetic frequency. If there is something wrong with the chemistry, then there is something wrong with the frequencies. Basically, the Chiren applies opposite vibrations to the one creating the disturbance. Cells not only radiate light, but also absorb it and store it. Cells contain biophotons (bio: life, photon: a single particle of light). A healthy cell radiates coherent light, whereas an unhealthy cell radiates chaotic light. With the CHIREN™, the chaotic radiation is separated, inverted and re-introduced into the body where it meets its opposite and thus neutralizes itself. As a result, only coherent (healthy) radiation remains. This is done by holding 2 glass rods or placing your bare feet on glass plates. The electromagnetic waves containing the different frequencies (laser light) are transmitted through these glass elements (see picture to the right). After this all the points are checked again to see the new situation. This is done by holding 2 glass rods or placing your bare feet on glass plates. The electromagnetic waves containing the different frequencies (laser light) are transmitted through these glass elements . After this all the points are checked again to see the new situation. 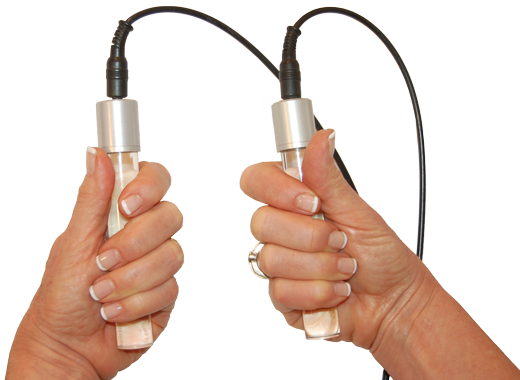 The CHIREN™ allows the practitioner to assess the resonance of the disharmony causing the disease. 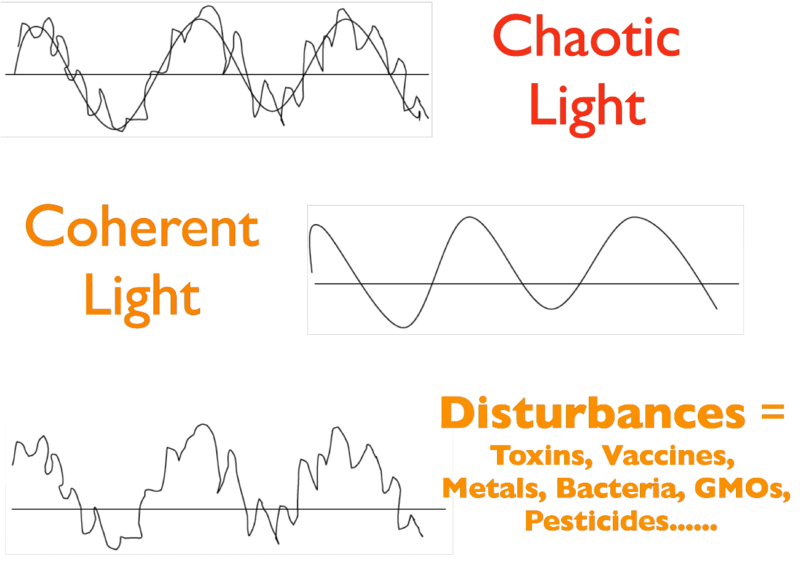 Then the body is treated by “inverting” the light wave pattern for the disease or microorganism, while at the same time “augmenting” the healthy, coherent light from ones own body. This neutralizes the illness and can lead to profound healing. Biophoton Coherency Therapy not only helps the body to be able to work optimally, but can also affect one on an emotional, mental and spiritual level. The Chiren also offers the possibility of transmitting the electromagnetic waves with the frequencies of supportive homeopathic remedies as well as Bach and Australian Bush flowers. It has an extensive library of the“energetic signatures” of the different flowers and herbs. These can be directly transmitted to you or to a liquid for later consumption. The use of homeopathic and flower remedies can support and help in the more subtle emotional and spiritual levels of a person’s life providing in this way a more holistic approach towards healing.